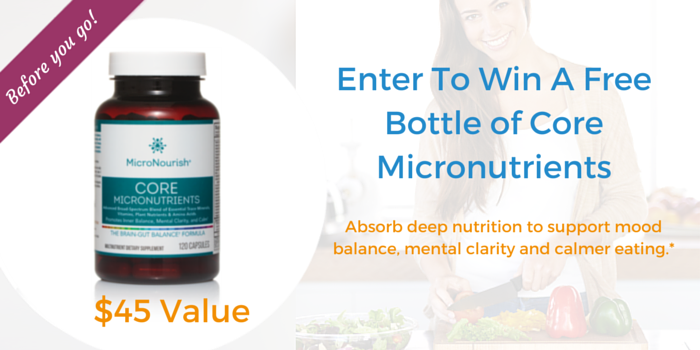 This Brain-Gut Balance FormulaTM was developed based on practical experience working with a host of individuals seeking mental equilibrium, and refined and improved based on scientific studies into the recommended amounts of micronutrients, and the specific ratios and preparations that make them most bioavailable (absorbed by the body). 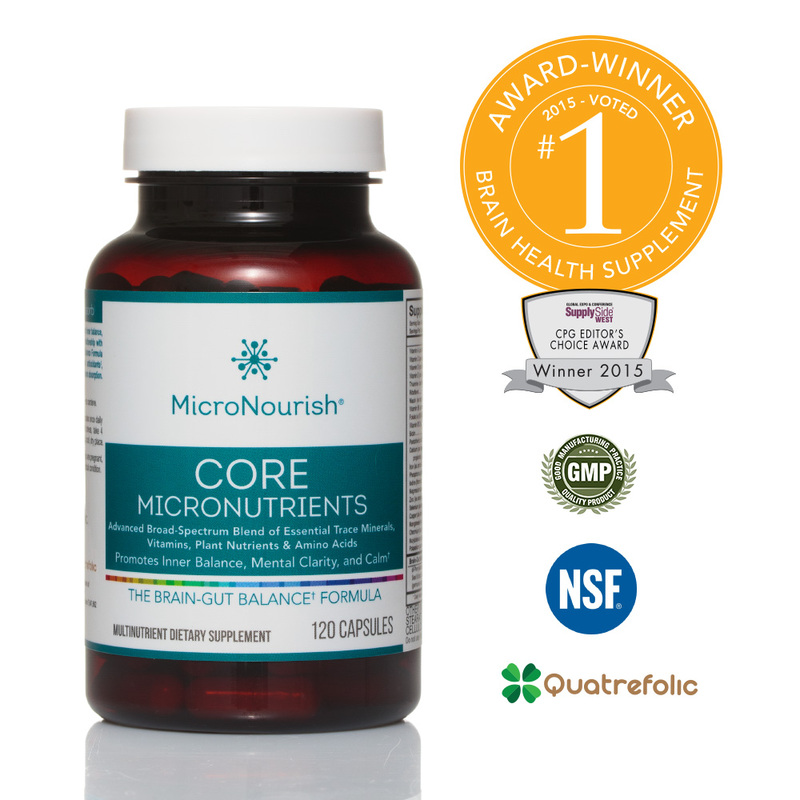 Core Micronutrients is manufactured with bioavailability in mind, to ensure that the ingredients you see printed on the bottle are more available for your body to absorb. YOU ARE WHAT YOU ABSORB.® 8 Week Starter Kit – To Help Promote Balance, Clarity & Calm. INTERACTION WARNING: Core Micronutrients is specifically known to alter the body’s response to psychotropic drugs. It is essential that you consult with your physician before taking Core Micronutrients if you are taking MAO inhibitors, neuroleptics, psychotropics, or any other forms of medication. Do not alter or discontinue any medical treatment based on information on this page, nor without total supervision and support of your medical advisors. This has been a life-changing product for me. I take it every day and think I always will. I just feel so much more balanced and focus on it than not. I used to be the queen of pulling all-nighters to get things done, and lived on coffee and a 4pm sugar-hit like my life depended on it. Within a few weeks of taking Core Plus+, my energy started to regulate, my cravings dropped and my moods were so much steadier. My PMS improved, I started exercising more and I lost a bunch of weight. I seriously believe that some kind of ‘shortfall’ must have been solved by this as the impact was so dramatic. It was like the big reset button that I’d been searching for all this time. An amazing product! I have been taking this daily and since then I have noticed a significant increase in energy, reduced cravings, better digestion and overall mental clarity and positive moods! It’s an incredible product, I can’t say enough about Core + and find myself noticing a considerable difference when I skip taking it, so now Core + goes everywhere with me! You must try it! I have a practice for Chinese Medicine (including acupuncture) in Switzerland. One of my main areas of specialties is in digestive issues. I started using Core about 6 months ago. After a month of use I felt that I was more balanced, sleeping well and better able to cope with stressful situations. I have since then been using the product with my patients who have had similar results. It takes a few days but I certainly felt a few changes whilst taking micronutrient solutions… I purchased the mood & clarity 8 week pack (enzymes, core plus and probiotics) and the impact was unbelievable. I have always suffered from digestive problems but these diminished over time when I started the micrnutrient course. I found that I was able to eat a lot of foods that previously I was very senstive to… not in huge doses but definitely a lot more tolerable than before. The biggest difference of all though was the clarity of mind and efficiency… there were times at work when I literally felt like my brain was on fire. There are days when I go to bed thinking I have a tonne of problems and I wake up the next morning knowing exactly how I’m going to solve or tackle them all. As a result, I feel more confident in taking work & personal life decisions. I also trust my thinking process more than ever and don’t feel the need to rely on other people’s opinions as much. It is like awakening from a sleepy state of mind.I love them and I hope the effect lasts…. I can honestly look in the mirror now, knowing I’m really taking good care of myself with the help of micronutrients. I look and feel good, because I’m getting the nutrients I need now. And for that, I am incredibly grateful.